The central portion of the car could be the most critical area for 2014 with the new power units putting a revised emphasis on cooling. Packaging and internal airflow structures therefore will become even more important as the teams battle with creating an efficient cooling package whilst also creating as little drag as possible. 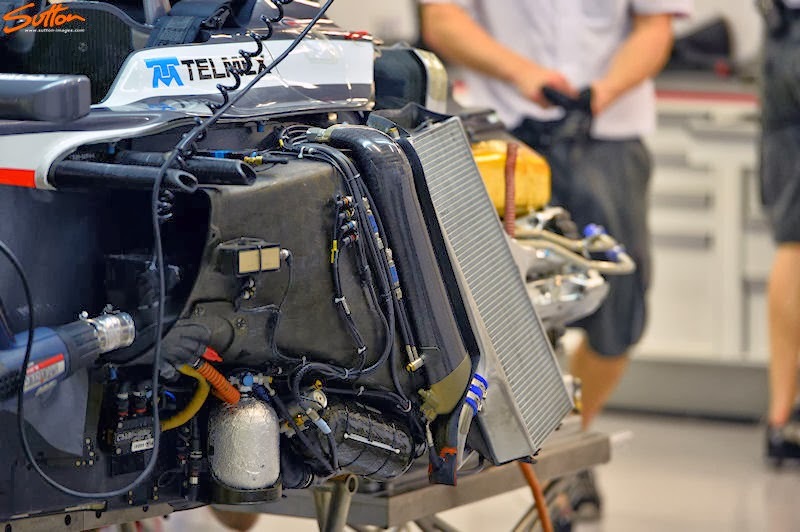 In terms of packaging, the design teams will have to consider the impact of the new power units which comprise of additional components they haven't had to account for in some time. Starting from the bottom and working our way up, the floor plays a pivotal role in how downforce is generated by a Formula One car. The exhaust blowing of the floor the sport has featured since 2010 is all but ruled out with the new regulations. With not only the singular exhaust exiting in a much higher centreline position the turbo that it's attached to will have most of it's energy absorbed by the MGU-H that draws wasted energy from it. This will have an effect on the design of the diffuser itself as the 'sealing' effect that running the exhaust in the optimum position to blow between the Diffuser sidewall and the tyres edge will be lost. I'll cover Diffuser design more expansively in the next piece, what we need to know here is that 2 design principles will likely be taken into consideration ahead of it. A reduction in the level of Rake run by the teams is inevitable, without the exhaust gases expanding the Diffuser's outer channels and sealing it's edges, the airflow dissipated by the tyres will 'squirt' into the diffuser laterally. This disrupts the airflow and makes the diffuser perform less consistently. Tyre Squirt is something that you'll have undoubtedly heard me talk about in the past if you're an avid follower of my blog and is something that affected teams even with their 2012/13 exhaust solutions. 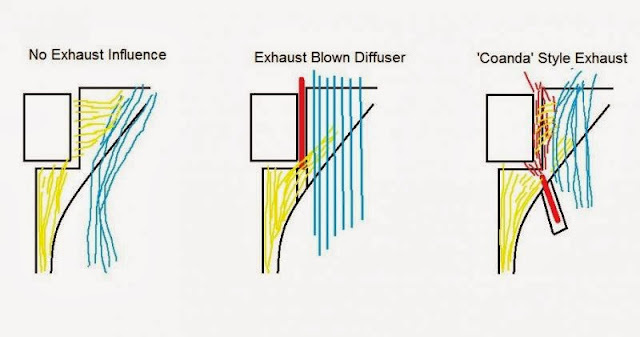 The image above is a basic explanation of how tyre squirt can influence the diffusers performance with Yellow representing the airflow moving over the cars floor to the rear tyre, blue represents the airflow moving under the car and through the Diffuser, whilst red indicates the intended target of the exhaust plume. As we can see from the left hand picture, airflow is pushed laterally into the Diffuser's path reducing it's ability to create downforce. For 2012/13 teams employed tyre squirt slots ahead of the rear tyres in an attempt to minimise the effects of tyre squirt as the driver came off throttle and thus blowing and sealing of the diffuser lessened. Each team as always has it's own way of designing this area to further manipulate the airflow and strengthen the vortex at the outer portion of the Diffuser. The use of the vertical guide strakes inbound of the slots are also crucial in how the airflow rolls up on the edge and into the Diffuser. As we can see all three teams (Red Bull, Lotus, Mercedes) have utilised either painted floor treatment (Red Bull) or metallic sections to stop the floor from warping (Lotus & Mercedes). The reason for this is these teams are also harnessing the exhaust plume and utilisng it's energy to increase the intensity of the vortex being generated. If the the floor were left untreated it would lead to a breakdown in efficiency over a sustained period. 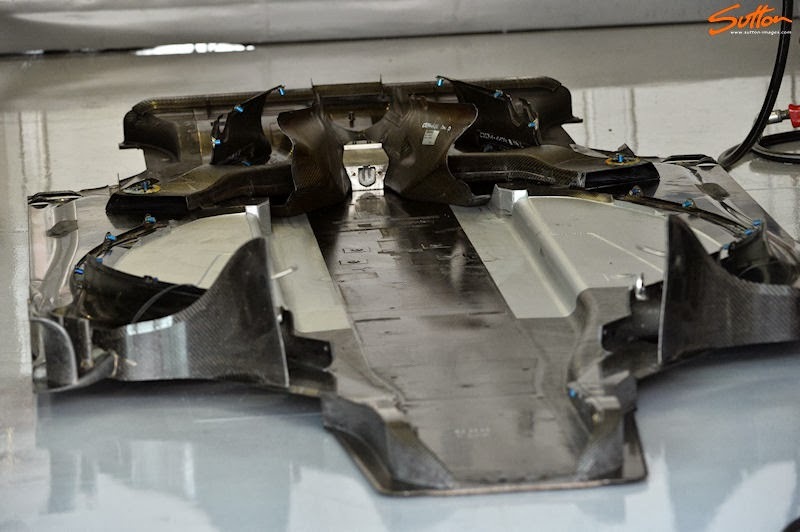 Obviously this won't be an issue for 2014 as the exhaust won't be placed any where near this section of floor but I suspect the area will still be proliferated with slots and strakes trying to move and vorticise airflow. We must also consider the leading edge of the floor as after all this too plays a pivotal role in how downforce is extracted from the car. Often overlooked but several items are placed here in order to make the flow into and around the Sidepods more efficient. 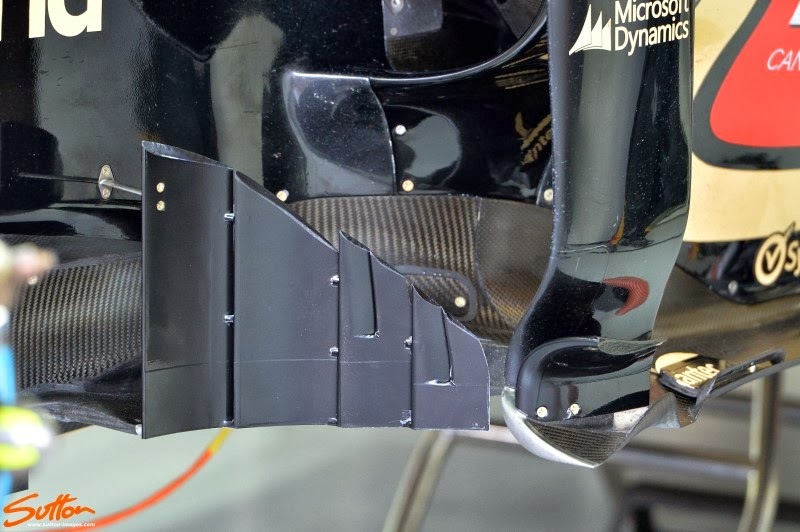 Bargeboards have been around F1 for decades and although their size, placement and orientation has altered with the prevailing regulations their function remains roughly the same. Both shield and enhance the airflow that is distributed by the Splitter around the front of the Sidepod. It shields the airflow from the front wheels tyre wake but through it's interaction also sets up airflow structures for the underside of the floor. The edge of the floor also see's teams adding additional vortex generating elements with strakes and cascades adorning the section just ahead of where the teams run their Airflow Conditioners. When the FIA looked to clear up areas in the previous regulations (pre 09) that allowed all sorts of aero 'flick ups' this area was left unviolated and as such development has continued in the area. Although some teams didn't start 2009 with them by the end of the season they were applied to all the cars. They haven't altered in their design drastically since then but moreover adapted to suit their surroundings. Their purpose is to protect the airflow that feeds around the front corner of the Sidepod, whether that be through the undercut or across the top of the Sidepod into the downwash toward it's tail end. The protection I refer to is the airflow dispensed by the rotating tyre ahead of it, especially in yaw. 2012 and 2013 saw the proliferation of extensions to the airflow conditioners, with teams extending and arc'ing them to meet with the shoulders of the Sidepod or in front of the leading edge. The shaping of the Sidepod's to enable the 'Coanda' exhausts (and before this the shaping required to maximise flow into the coke bottle region) means that the area creates lift at certain speed thresholds. Vortex Generators and the Airflow Conditioner extensions mentioned above help to reduce the problem of lift over a wider speed threshold, these devices are likely to continue to appear throughout 2014. The core of the car runs along the centreline of the car with the Chassis being the load bearing structure that everything else bolts to. For 2014 most of the focus will be placed on the new power units and understandably so, however we must also play close attention to the ancillary components that must be packaged alongside it. The fuel cell will be reduced in size for 2014 with 100kg fuel limit per race coming into effect, whereas the current V8's use around 150kg's per race. You'd also expect that the physical dimensions of the V6 unit would be smaller than that of the current V8's however due to the additional ancillary components of the Turbo and ERS it will likely have a slighter larger footprint. One of the biggest concerns for both the engine manufacturers and teams will be cooling, with the necessity to cool the charge air a probable concern. Supercharging by means of an exhaust driven or mechanical turbine was outlawed by Formula One in 1989 and since then we have seen the decline of engine capacity from 3.5 litre V12's down to the outgoing 2.4 litre V8's we waved off in Brazil this year. The FIA know that engine development is crucial in terms of both it's environmental impact but also in providing a worldwide rationale that things can be done more efficiently. I won't go on too much in this article about the power units directly, as I'll cover these more extensively in their own article. Suffice to say though that since their use in Formula One 25 years ago the associated technology that 'Supercharging' brings to the table has increased exponentially. Furthermore the designers grasp on internal aerodynamics has increased rapidly too. The largest challenge facing the designers is the scope needed for intercooling the turbocharged air. The initial tentative diagram released by Renault showed a singular IC (obviously not to scale) and the idea was enforced when Renault released further pictures at the power units official launch. Although Mercedes have released some tentative images they are being more coy in terms of establishing whether there is a need for an IC. Both manufacturer's show a singular outlet on the Turbo which would suggest an asymmetric design within the Sidepod to house the IC, however in terms of aerodynamics this would have be a no-no with one Sidepod creating more internal drag than the opposing side. So this suggests to me one of two rationales, either the ICE doesn't require as much cooling and will run with a singular radiator in one Sidepod with the Intercooler placed in the other. Or the Intercoolers size parameters are small enough for it to be housed underneath the exhaust outlet. I would strongly suggest that the teams will use a single pass intercooler too as their need to retain or keep latent cooled air in the intercooler is limited. The size and shaping of the intercooler(s) and radiator(s) are of course essential when considering the shape and design of the Sidepods. I suspect we shall see teams edging back toward the type of sculpted design seen on the RB6, with an aggressive undercut to the front of the Sidepod and a tapered tail end clearing maximum area into the coke bottle region. The efforts made by Sauber in the design and layout of the radiators and other components of the C32 may also stand them in good stead, whilst also highlighting the merits to other teams. 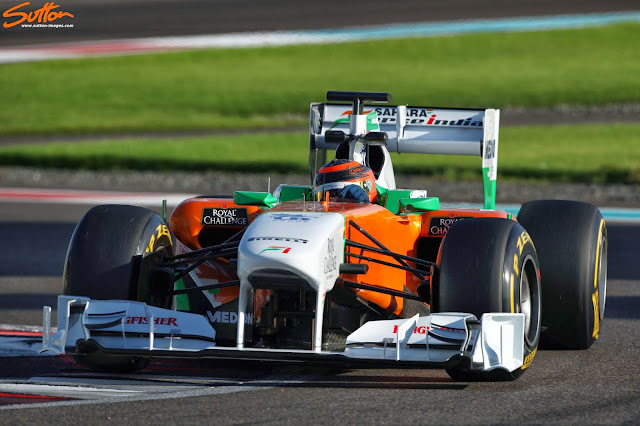 Once the 2013 tyres were switched for 2012's construction it became apparent that although some had pointed to their radical Sidepods as an issue, they were not the root cause of their early season slump. Often overlooked but this area of the car is one that each team has it's own unique take on, during the last rule set we even saw teams trying on blade style, a trend started by Mercedes (2010) and subsequently mimicked by Team Lotus (now Caterham) and Force India (2011). The area is a battle between aero and safety as the designers try to carve away as much space around the structure as possible to aid in airflow. The structures intent however is of course to prevent the drivers head from impacting with the ground in the case of the car rolling over and so safety is paramount. The airbox inlet therefore is the secondary function of the area but nearly as important as it provides a much needed breathing apparatus to the engine. 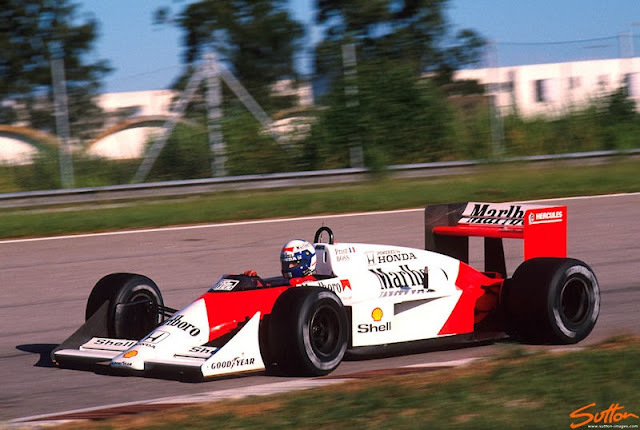 The last great turbo car the McLaren MP4/4 and it's predecessors did away with the airbox inlet above the drivers head and instead simply employed a roll hoop to protect the driver. In the case of the MP4/4 it was powered by a twin turbo V6 and so the turbo's were packaged in either Sidepod. 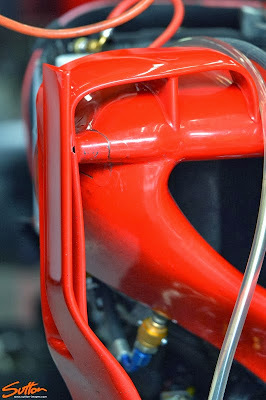 This of course allowed the team to isolate the inlets outboard instead (Periscopes atop of the Sidepods in this case). The new regulations stipulate that the singular turbo must be placed along the centreline and so this arrangement might not be pertinent as it would increase the pipework length and complexity of the aero structures around the Sidepod. I only bring up the matter from both it's historical context and the fact the airbox does create a certain level of blockage that impedes the rear wings performance. It's a necessary evil of course as the engine cover also has to be designed with dimensional criteria in mind and allowances are made to cater for the airbox in the rear wings aerodynamic design. More recently we have seen the 'Ears' that were attached to the Lotus E20/21 airbox of which their primary function was to facilitate DRD. The fact that the team bonded these to the chassis however says more about the fact that the airflow structure created at the airbox/roll hoop doesn't have a mass effect on the Rear Wing. 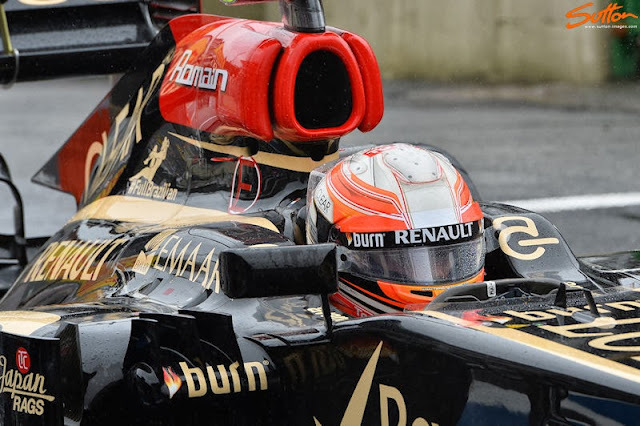 DRD was only run competitively once by Lotus on Kimi Raikonnens car at Silverstone and so if the effects were dramatic they would have removed the appendages. Here's a question maybe you can answer. Can the turbo charger pull enough air that it would have an aero effect on the car? The simple answer is yes, quantifying these effects is difficult however especially as each design will differ and moreover we rarely see the internal pipework of the airbox. The complexity of the power unit far out weighs any research I have either conducted myself on my own turbo/supercharged track car and/or I have read in any research documentation. The unit is effectively being compound charged much like the 80's Group B Lancia Delta with the MGU-H playing the part of the Supercharger. 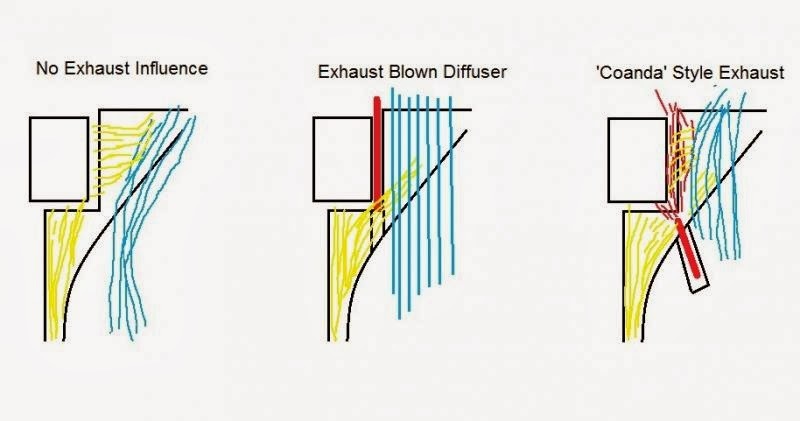 Any simulation of flows contained within the engine cooling or lubrication systems, air, air/fuel mixtures, combustion process or products of combustion from a boundary commencing at the engine air intake duct, passing through the engine and finishing at the exit of the exhaust tailpipes will be classified as an Engine Simulation. I'm quite sure this is something that I'll look into as the 2014 season progresses.